Produktinformationen "Marvin Test Solutions: MV-GX6138: 3U High Density Switching PXI Card with 38 Channel Form-A Relays"
The Marvin Test MV-GX6138 is low cost 3U switching card with 38 individual low level SPST Form A relays capable of switching 0.5 A at 200 VDC. The MV-GX6138 is ideal for applications requiring high density switching. 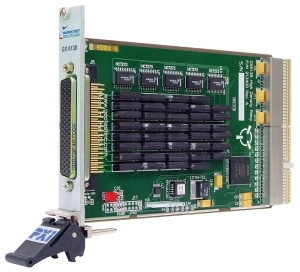 The MV-GX6138 High Density Switching PXI Card consists of 38 individual relays and a 78-pin D type connector which makes it is easy to interface to the UUT or system receiver. Each of the relays can be latched or unlatched under program control. Weiterführende Links zu "Marvin Test Solutions: MV-GX6138: 3U High Density Switching PXI Card with 38 Channel Form-A Relays"